We heard there was a new brawler/RPG co-op game in the works called Young Souls, but outside of a vague description and a few concept shots, we didn't know too much about what to expect. While we're still a little shy on all the details, developers The Arcade Crew and 1P2P Studios dropped an official announcement trailer recently that has some interesting tidbits in it. Before getting into what you can see in the trailer below, just want to give a quick shout out to the art style here. 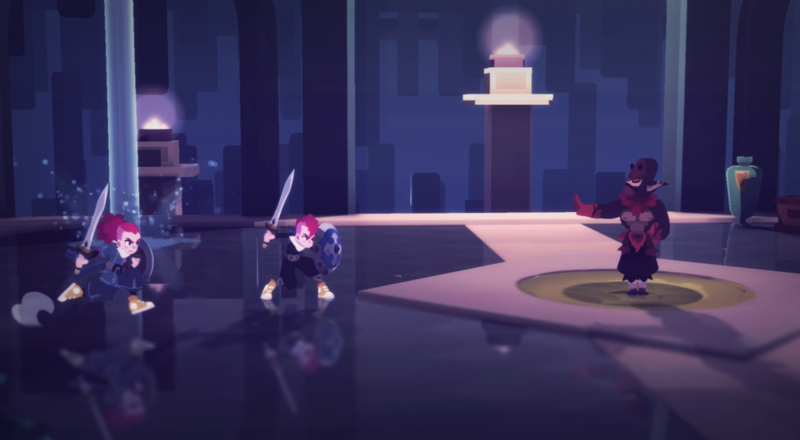 From the environments to the motion of protagonists Tristan and Jenn and the enemies, Young Souls has a great look. Hopefully the gameplay matches! Speaking of, while there are a lot of jump cuts and scant seconds spent with anything meaningful, there are a few things we noticed. You'll be able to equip a variety of gear to various slots (i.e., head, body, feet, weapon, etc), with varying stats for the gear. The hats and armor that are briefly shown also appear to have some kind of level attached to them, so possibly there will be better quality versions of the gear you can find. Speaking of stats, there are three bars shown for Tristan and Jenn when they're in combat: health, stamina, and mana. We're guessing that you'll be able to choose what gear you want that will boost those in order to shift between physical and, perhaps, magical builds as battles require. There's a brief moment when Tristan and Jenn are fighting where Jenn knocks an enemy up and Tristan hits them, so possibly some kind of co-op combo mechanic. For now, still no word on what platforms Young Souls will be coming to, or when, exactly, it will be doing that. We've listed it as a PC title, and will update that when we hear more. Page created in 0.9616 seconds.